by: Scott Cairns 126 pgs. Chosen as one of the Top 10 Religion Books of 2009 by Publishers Weekly. Is there meaning in our afflictions? 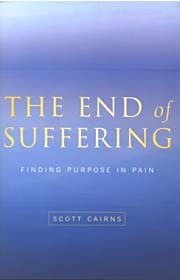 With the thoughtfulness of a pilgrim and the prose of a poet, Scott Cairns takes us on a soul-baring journey through ‘the puzzlement of our afflictions.” Probing ancient Christian wisdom for revelation in his own pain, Cairns challenges us toward a radical revision of the full meaning and breadth of human suffering. ‘Like most people I, too, have been blindsided by personal grief now and again over the years. And I have an increasingly keen sense that, wherever I am, someone nearby is suffering now.